Esoteric Alyssa is an anime girl who enjoys making flowers from her hand. She also likes strolling through dark, mysterious woods. As indicated in this drawing, Alyssa has large purple eyes that match her hair, shoes, and trees in the background. 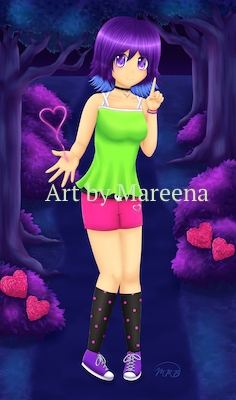 Hearts adorn her belt, black choker necklace, and are designed into pink flowers located in some of the tree bottoms. The ability to make flowers from her hand is demonstrated with a fascinating heart dangling above her right palm. In addition to the black choker necklace wrapped around her neck, Alyssa wears a black belt that closes around her waist with a skull fastener. She also wears black knee high socks with pink polka dots. Topping off Alyssa’s outfit is a green blouse with crisscross straps and two beaded bracelets encircling her left wrist. Alyssa mysteriously points the index finger of her left hand leaving the viewer to decide why she does so. Mareena drew this piece during the summer time in 2014.